Shigeru Ban Architects have designed temporary homes for Japanese disaster victims inside a chequerboard of stacked shipping containers. Once the Multi-storey Temporary Housing is constructed it will provide 188 homes in Onagawa for those left homeless by the Japanese earthquake and tsunami. The containers can be placed on unlevel terrain or narrow sites and should be able to withstand future earthquakes. Containers can be stacked up to three storeys high, with open spaces between each apartment. The architects, who have constructed one prototype apartment, suggest that temporary residents may choose to stay in the containers permanently. Since the disaster in Japan, Dezeen has published a few projects by designers to raise money for victims - see all the stories here. Another recent story on Dezeen features shipping containers that provide a sea-facing observation deck - click here for more stories about container architecture. Temporary housing are starting to be deployed disaster areas. However, the number of the amount of housing required is insufficient. The main reason is that most of the damaged coast areas are not on level terrain. Usually, temporary housing is suitable for flatlands, and providing the required number of units is difficult. 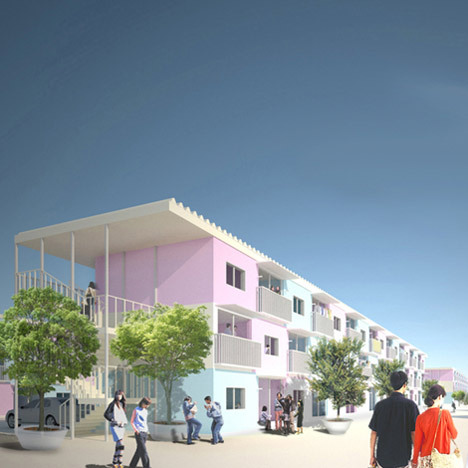 Our project to Onagawa, Miyagi prefecture is to use existing shipping containers (20 feet) and stack them in a checkerboard pattern up to three stories.